The museum, which opened its doors to the public in March 2017, is owned by the Puentespina family behind the Malagos Agri-Ventures Corporation that has been in the agricultural industry for over 30 years. They have been known for producing the award-winning, proudly Philippine-made, and internationally-renowned Malagos Chocolate since it was commercially launched in June 2013. Located inside the Malagos Garden Resort in Davao City, the museum offers "The Tree to Bar Experience" and is divided into different interactive parts. First off, get to experience the journey of hardworking cacao farmers in the Puentespina Cacao Farm. The museum section will then fill you in with the wonders of cacao -- its history, various types, and how it is made -- through infographics and AVPs. The museum itself is IG-worthy with its interactive displays. There is also a children's zone where kids can play the chocolatey way with Beanie, their mascot. 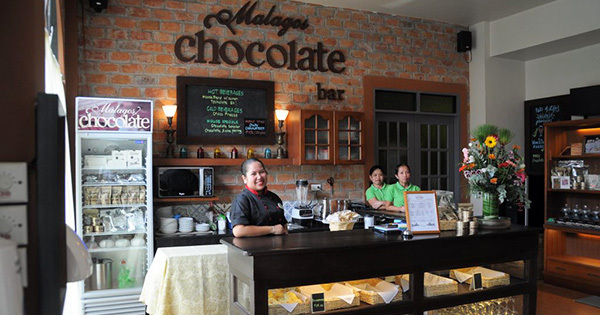 Of course, it is a must to enjoy all sorts of Malagos Chocolate foods and drinks, such as homemade ice cream, ensaymada, hot chocolate, among others in the in-house vintage-looking Chocolate Bar. What's more, you can also create your own one-of-a-kind chocolate bar at the Malagos Chocolate Lab. Experience being a chocolatier and experiment with different chocolate molds, toppings, and spices.